This vintage Barbie doll clothes pattern has five adorable outfits you can make. Classic shirtwaist dresses, top and capris and of course the basic shift dress that goes with everything. Examine your fabric to be sure it is ready for cutting, pre shrunk if woolen, edges straight so that the fold is along the gran of the fabric. When making a lengthwise or crosswise fold in your fabrick, always fold the right side of the fabric to the inside. Pin the patterns pieces to the fabric, following the layout and making sure that the grain lines are properly placed. If you have any experience sewing, then sewing doll clothes should be a snap. The theory is much the same as sewing for a person, only in a smaller scale, which may require a little extra thought. Unlike human clothing you do not have to take physical motion into account, which may actually make the task easier. You may also be able to avoid interfacing fabric, unless the material you are working with is extremely delicate. One of the first steps is to measure the doll you are sewing for. If the doll came with some clothing already, it can help to examine the clothes and see what the measurements are and how they are constructed. 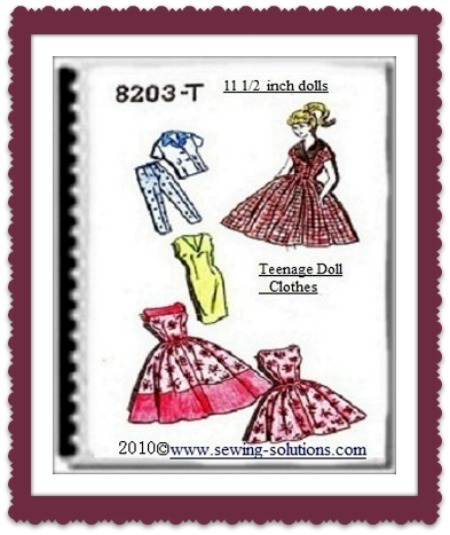 If you're a beginner, pick a very simple pattern at first, like these vintage Barbie doll clothes patterns. It can take some time to work up to the ultra-fancy clothes with ruffles or elaborate stitching. Try a simple smock dress, or an apron to begin with. Both of them are very easy patterns. You can stitch doll clothing on a sewing machine, although the very small details may need to be done by hand.